Spencer Beach, an 1887 Iowa State graduate, returned to his alma mater in 1905 as head of the horticulture and forestry department. It was his interest in breeding cold-hardy fruit that brought him back to Iowa. Considered one of the best-known horticulturists of his time, Beach developed at least 14 varieties of apples. The Chieftain apple was developed in 1917 when Beach crossed Delicious and Jonathan varieties and came up with what some consider the best of both. It combines the shelf life and color appeal of the Red Delicious and the taste and baking qualities of Jonathan. 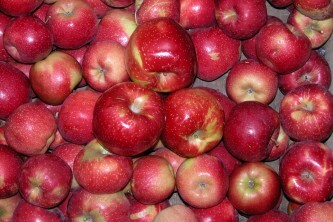 It has a deep bright red skin, improved flavor, crisp texture and stores well. It is good for both baking and eating fresh. Chieftain was released for public consumption in the early 1960s and soon became a favorite of both growers and consumers. It is one of the top 10 commercially grown varieties in Iowa, are served on the Iowa State campus and sold in the Horticulture Club’s annual apple sales. Thomas Maney was a graduate of the Iowa State horticulture program in 1912. He was hired by the college immediately following his graduation, and continued working with the department for the next 33 years. He was head of the pomology sub-section of the Experiment Station for 28 years. Maney gained national recognition for his work with hardy dwarf apple stocks, and also did extensive work on raspberries, strawberries, junipers and roses. His paper “Grape Production and Distribution in Western Iowa” is still used as a relevant source of information about grape growing in Iowa. Griffith Buck served the Department of Horticulture at Iowa State from 1949 to 1985. He was primarily interested in floriculture and his research focused on rose and geranium breeding. Buck is credited with developing more than 85 varieties of roses, many of them hardy enough to withstand the cold Iowa winters. He was the first to develop a hybrid blue rose, and is widely known for his developments with geraniums and other flowering plants as well. The Dr. Griffith Buck Rose Collection at Reiman Gardens has been accepted to the North American Plant Collections Consortium, as one of its only cultivar-based collections. Charles Hall’s plant breeding research led to the creation of several watermelon varieties, including the Crimson Sweet, which is grown in more than 50 countries. Crimson Sweet contains fewer and smaller seeds, has a sweeter flavor, a thinner rind, as well as an increased resistance to plant disease. Other varieties developed by Hall include All Sweet, Super Sweet and Petite Sweet. Hall is an emeritus professor and served as head of the horticulture department from 1974 to 1990. Three of the best performing weigela varieties for Iowa are Red Prince, Pink Princess and White Knight, all introduced by Iowa State horticulturist Jack Weigle. Weigle’s new cultivars of weigela, hybrid impatiens and forsythia gained recognition by gardeners throughout the central United States. Several of his plant introductions became popular choices for nurseries and home landscapes. In the process of conducting research on turfgrass diseases, Nick Christians, professor of horticulture at Iowa State, discovered that corn gluten meal controls crabgrass and other weeds when applied before plants emerge. Corn gluten meal (CGM) is a natural byproduct of the wet milling process of corn. In 1991, Christians was granted a patent on CGM as a natural, preemergence herbicide for use on all crops. The patent was reissued in 1993 with broader claims that cover its use on field crops and home gardens. Two additional patents were issued in 1993 on the technology. Patents also were filed in the U.S. and Canada in 2011 on improvements on the corn gluten technology. Corn gluten meal gained national attention as being the first effective natural herbicide, and is marketed and distributed under several trade names. Potatoes are among the world’s most important agronomic crops. However, many desirable breeding lines of potato produce tubers too late in the growing season or with too low a yield to be commercially viable. David Hannapel, horticulture, and Guru Rao, biochemistry, biophysics and molecular biology, have discovered two transcription factors in transgenic potato plants whose overexpression can increase yields and shorten cultivation time. This work has been supported by the National Science Foundation and USDA. 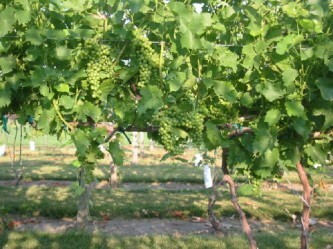 In 1919, Iowa ranked sixth in the nation for wine-grape production, harvesting more than 12 million pounds of grapes. But by 1940, the Iowa grape industry had all but been eliminated. Today, the Experiment Station is one source of funding for the Midwest Grape and Wine Industry Institute at Iowa State, formed in 2006 as a result of the state’s evolving grape and wine industry. Goals include conducting research to develop new cold-hardy grape varieties that can thrive in the Midwest, conducting enology (the science of wine and wine making) research and developing a wine quality award program for wine buyers. Murli Dharmadhikari is director of the institute. Bioplastic plant containers being developed at Iowa State could save the specialty crop industry an estimated $706 million annually by converting from petroleum-based containers. Other benefits include shifting resource revenue from foreign oil to domestic biorenewables and eliminating adverse environmental effects of petroleum-based plastics. Bill Graves, professor of horticulture, leads the research team, funded by a USDA grant.